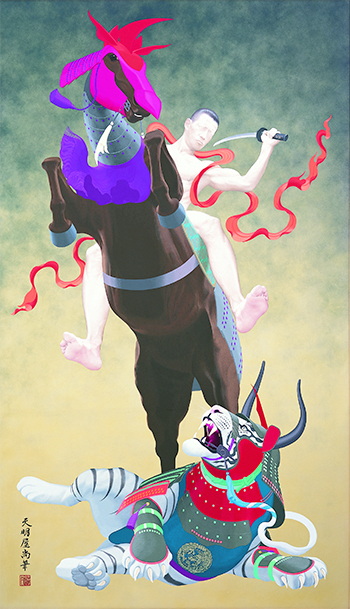 Tenmyouya Hisashi’s exhibition “Rhyme ?” opens on October 22 at Mizuma Art Gallery. In the previous “Rhyme” exhibition (Mizuma Art Gallery), Tenmyouya impressed the audience with a stunning array of paintings inspired by both western and Japanese cavalry images, and an installation of a red-tinted Zen garden. Coming two years later, this next solo show basically shares the same underlying concept, and may be considered as a sequel in terms of displayed works. Featured here in addition to the two-dimensional Brutal is a wood-carved tower made based on Tenmyouya’s sketches by a danjiri (wooden cart) sculptor specializing in danjiri for the Kishiwada Danjiri Festival. The lineup of visually and stylistically eccentric works transforms the venue into a glamorous, special kind of place. Also exhibited in a separate room is Neo jigoku gokuraku zu (Neo picture of Buddhists’ hell and paradise), a painting that sparked a controversy right after the beginning of this year. The exhibition is part of a special program that kicks off in October, titled ”Autumn, the season of art! October, the month of Tenmyouya Hisashi! Ten things Tenmyouya in the tenth month!” Next to concurrent solo exhibitions at three locations in Tokyo (Shibuya, Roppongi and Ichigaya), the program includes the publication of an art book; collaborations with XLARGE, BE@RBRICK and TAILOR TOYO; Tenmyouya’s curation of a group exhibition in Singapore, and his participation in group exhibitions at the Japan Society (USA) and the Taro Okamoto Museum of Art, Kawasaki, all of which start around the same time this October. The idea behind this program is to evaluate the various dimensions of Tenmyouya Hisashi through representative past and new works, drafts and prints, as well as his recent art book, collaborations, curation and participation in exhibitions. 1. A selection of past representative works is on display at Parco Museum. 2. A brand new work is unveiled at Mizuma Art Gallery. 3. Drafts and prints are exhibited at Roppongi Hills A/D Gallery. 4. Tenmyouya’s art book Masterpiece is published by Seigensha. 5. Tenmyouya collaborates with the street fashion brand XLARGE. 6. Tenmyouya collaborates with the street fashion brand XLARGE and BE@RBRICK. 7. Tenmyouya collaborates with the street fashion brand XLARGE and the well-established Suka jacket brand TAILOR TOYO. 8. A new installation is on view at the Taro Okamoto Museum of Art, Kawasaki. 9. A number of Tenmyouya’s most representative works are featured in a group exhibition at the Japan Society, USA. 10. Tenmyouya curates a group exhibition at Mizuma Art Gallery Singapore.